Last in the series on Vermont Beef Jerky Co. is this Maple & Spice variety. See my previous review of their Original beef jerky. 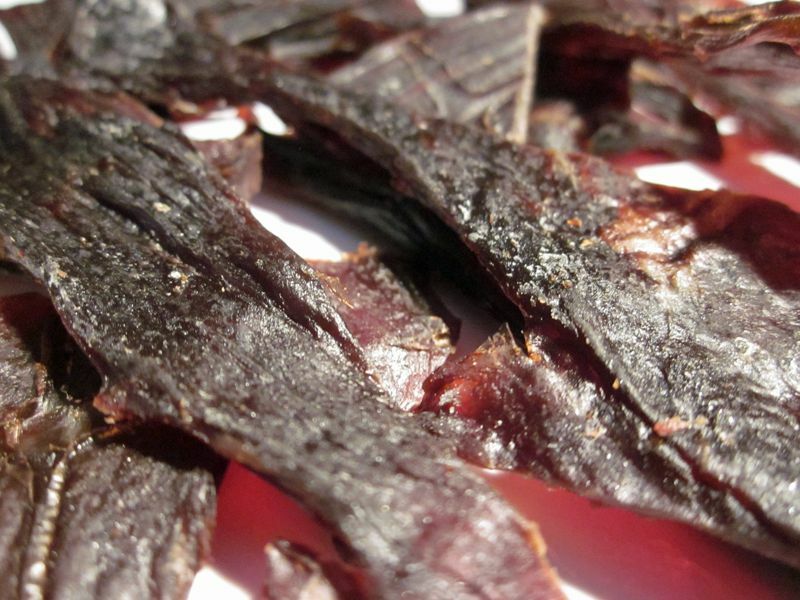 Vermont Beef Jerky Co. is based in Orleans, VT and makes jerky in their own USDA inspected facility. They make four varieties including this Maple & Spice, the Original, along with Hickory Smoked, and a Teriyaki. All but the Teriyaki are said to be hickory smoked. Beef, soy sauce, maple syrup, worcestershire sauce, flavorings, mustard powder, red pepper. The first thing I taste from the surface of these pieces is a light sweetness, and a light soy sauce flavor. There's a light smokiness noticeable. Soon after, a bit of saltiness comes in. The chewing flavor starts with a more defined soy sauce flavor. Sometime later, a faint bit of worcestershire is detectable. For being advertised as "Maple & Spice", it doesn't seem to hold up. I can't really taste anything that resembles the unique flavor of Maple, and there's nothing spicy about this. If anything, I taste some sweetness, but that sweetness doesn't reveal the flavor of maple syrup. This jerky is actually quite mild in that I don't taste any blend of spices. I can't taste the red pepper ingredient and there's no bite from any kind of pepper at all. 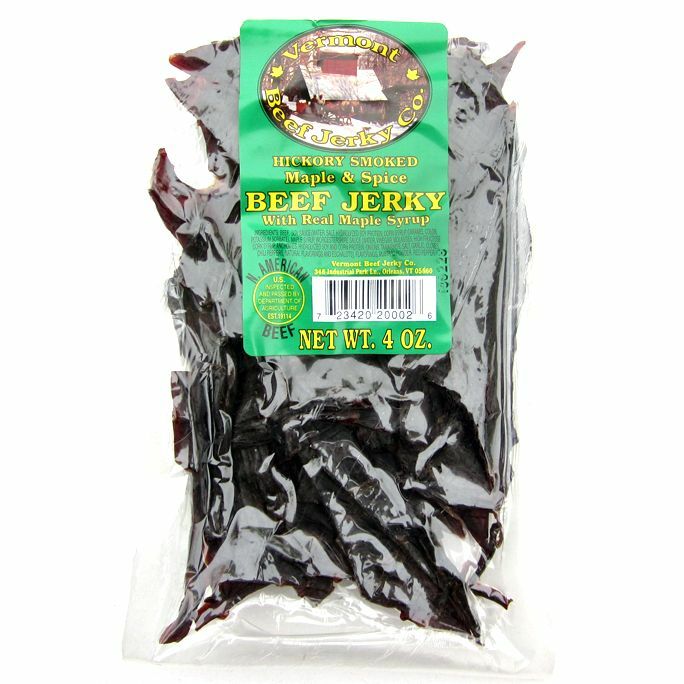 Otherwise, this jerky seems to taste much like the company's Original variety, largely a soy sauce flavor, except this has some sweetness. There are some light natural meat flavors in some pieces, but none in others. Some pieces contain small chunks of fat which seem to give off a more beefy flavor, but that's about it. The level of saltiness in this tastes lighter than the Original. It's still a dominant flavor along with the soy sauce, but I think the added sweetness tempers it and make it feel less salty. Overall, what you're going to taste in this is a mostly a soy sauce flavor, with a medium level saltiness, and an overall light but noticeable sweetness. There's no maple syrup flavor and no spiciness. The chewing texture starts out feeling like soft pliable plastic with a fair amount of chewing resistance. After several chews it finally breaks apart and then quickly chews down to a soft mass. At that point it feels very much like real meat, and rather steak-like. In terms of clean eating, it's very clean with no residue on my fingertips and no bits of meat fragments falling on my lap due to the bite-sized pieces. 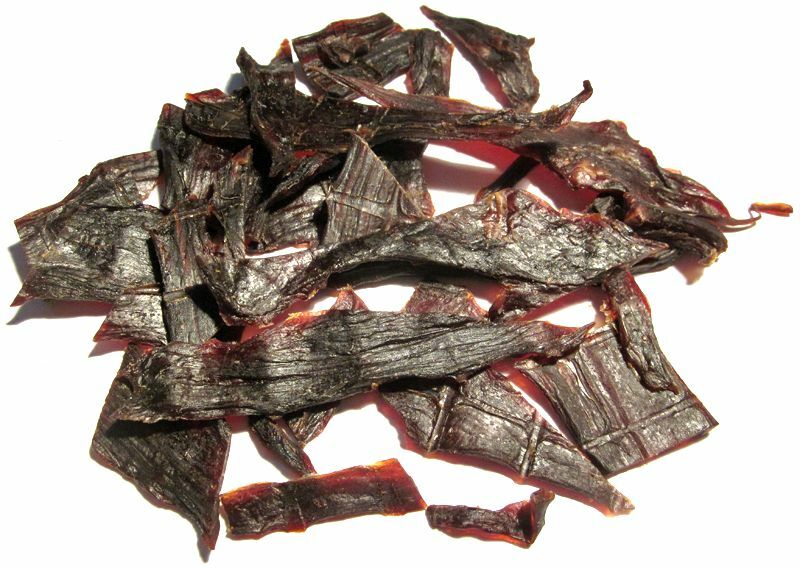 Vermont Beef Jerky Co sells this Maple & Spice variety from their website at a price of $4.00 for a 4oz bag. I bought four bags in all, which includes two of this Original and two of their Maple & Spice. Shipping costs came out to $5.00 for a total of $21.00. That works out to $1.31 per ounce. 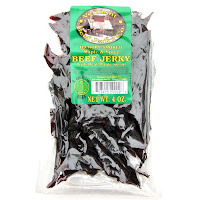 For general jerky snacking purposes at the $1.31 price per ounce, this jerky offers a decent value. I'm getting a fair amount of snackability for a satisfactory flavor and good meat consistency. It's only because it's priced considerably less than a Jack Link's or an Oberto brand that it's a decent value, otherwise the flavor, meat consistency, and snackability are comparable. As a Maple & Spice variety, at the same $1.31 price per ounce, it's a weak value. I can't seem to taste any maple syrup flavor, only a moderate sweetness, and absolutely no spiciness. This Maple & Spice variety from Vermont Beef Jerky Co. doesn't really live up to its advertised flavor. I couldn't pick up any maple syrup flavor, but only a moderate sweetness. Otherwise, it's comparable to the company's Original variety, except with a noticeable a sweetness. And that sweetness seems to have softened the stronger saltiness in the Original. I think this Maple & Spice variety is more palatable than the Original for those reasons, but overall I don't still see this as being above the average lot of jerky brands. It seems to have an average level of snackability, with a good overall meat consistency. You're just not going to get any kind of above average flavor. And considering this comes from Vermont, a place known for its maple syrup, it's disappointing that I can't taste the flavor of maple syrup. I think a good beer pairing for this is a simple IPA. The added sweetness and lower saltiness in this particular jerky should do better with a beer lighter in body and sharper in flavor. Try the Stone IPA or the Sierra Nevada Torpedo.